Marine Staff Segeant James Sides lost his right arm from the elbow down following an IED explosion in Afghanistan in 2012. For a while, Sides was using a prosthetic hand to give him some semblance of life before the accident. Eleven months later, and Sides is using a potentially revolutionary new prosthetic that can be controlled by his own muscles. You and I are able to move our hands by sending electrochemical signals from our brain, through nerves, and to our muscles, which contract to create the intended movement (grabbing, waving, etc.). Existing prosthetics are unable to recreate this process because those signals can't travel to the intended target. But new technology, developed by the Alfred Mann Foundation, is making it possible to create a bridge between these lost signals. Through a process called Implantable Myoelectric Sensor (IMES), researchers have created a minimally invasive alternative that attaches wireless IMES sensors to the residual limb of an amputee, which then detect signals going to the muscles that control specific movements. Think of it in context of using an app on your phone to control your computer. The signals from the IMES are sent to a decoder box worn by the amputee, which are then translated into the intended movement in the artificial limb. 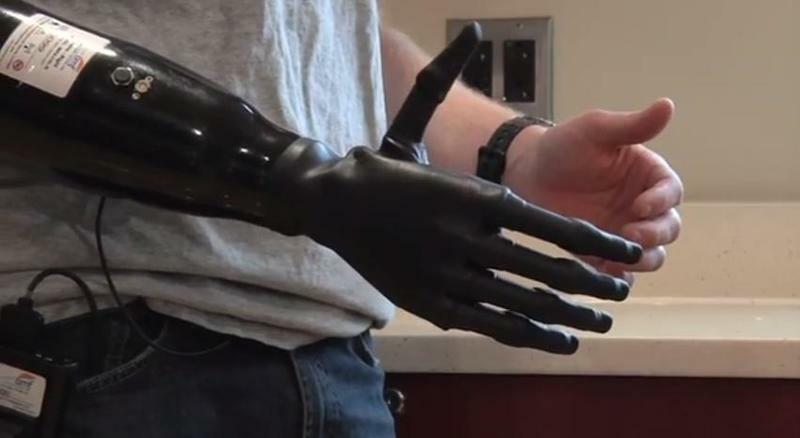 In essence, users, such as Sides, are able to control their prosthetic limb with their brain. The FDA has approved the operation of three different degrees of freedom—future iterations will include up to 13 angles of motion—including opening and closing the hand, 180 degree wrist rotation in clockwise and counter-clockwise directions, and lateral movement of the thumb to allow users to grasp objects. Watching the video below, you can see just how incredible—and freeing—the IMES technology is. "It's just opened up a whole other world of doing tasks," Sides said, "like I used to be able to [before the accident]." The IMES use about a half-dozen electrodes made of platinum/iridium, and are powered by magnetic induction, which means there's no need to swap batteries or plug them in. Actions are translated in less than 100 milliseconds, which is relatively negligible for amputees used to prosthetics with limited range of motion, or none at all. There are a few drawbacks to the technology, however. According to Dr. Paul Pasquina, principal investigator on the IMES system, the connection through a user's skin is "inexact," meaning patients are required to learn to flex different muscles to activate the electrodes. Basically, you have to reprogram your mind, Pasquina said. The second major drawback is that the external connection can be interrupted very easily, either by getting wet or reaching overhead, for example. While the system isn't perfect, Pasquina is already imagining the IMES system affecting service members—and other amputees—in a positive way. This early on into Pasquina's research, Sides is already able to do things such as drink a Red Bull, lift a heavy Dutch oven lid, and perform more precise tasks, like sorting tiny blocks into separate bins. So long as research continues to move forward, the possibilities are endless. "I still close what I think is my hand," Sides said. "It's exactly as if I still had a hand."